Welcome to one of the most influential books ever written on public speaking. This book was written, we believe, some time in the first century BC, possibly in the 90s. 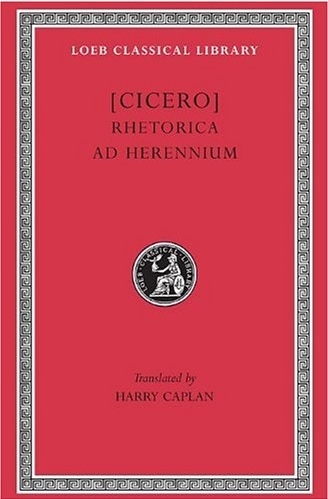 Although Cicero was said to be the author, this is now discounted. Our unknown author, whoever he was, dedicates his work to Gaius Herennius and the book is commonly called Rhetorica as Herennium for that reason. The Latin text along with its English translation by Harry Caplan can be found in The Open Library. I have taken Caplan’s original 1950s translation and modernised the words and phrases in order to make the advice seem more pertinent to a 21 century reader. In doing so I may have deviated from the original Latin meaning, for which I apologise to all Latin scholars everywhere. My aim is not a faithful reproduction of the advice to a long-dead Gaius, but to produce something of practical use to a modern speaker. Start reading a modern adaptation of Rhetorica ad Herennium from the beginning. Dip in and out of the sections that interest you.